Physical Characteristics: Coniferous tree grows up to 40 – meters high with a diameter of 1 – 3 meters at base; old growth or “ancient” cedar can be over 5 -meters at base. Bark is cinnamon-grayish color and easily peeled in long fibrous strips. Branches spread and hang low but upturn at tips. Leaves are aromatic with shiny-yellowish color; overlap and arranged in four rows with upper/lower pair flattened and side pair folded into flat fan-like sprays. Habitat: Very shade tolerant. Can survive in darkened under-story; has low resistance to drought and frost. Requires moist soils and almost never found above 4200 ft. elevation. Ability to reach over 1,000 years old and is decay resistant. Indicator plant of Temperate Rain Forest. Remnant Western Redcedar provide important habitat for numerous plant/animal species. Range: British Columbia, western Alberta, western Montana and North Idaho. Found in moist – wet, sites from foothills to montane areas. 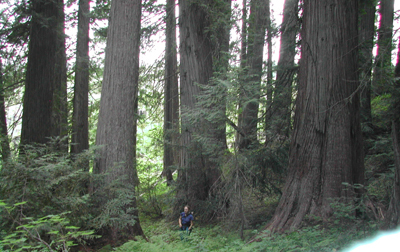 Western Redcedar is a coastal disjunct species found in Clearwater Basin. Reproduction: Cones are both male/female and cluster on ends of branch tips. Male cones (pollen) are round and 2 – mm. long. Female cones are narrowly egg-shaped, 8 – 12 mm. long with 6 – 8 dry brown scales. Cone production takes place between April – May. Threats: Rapidly disappearing from parts of range in western Alberta and British Columbia due to logging. Also being reduced in western Montana and North Idaho. Remnant groves (old growth) are rare and should be protected in Clearwater Basin. Report in 2004 by FOC staff and others identified approximately 30 – groves warrant such protection. Miscellaneous: Native Peoples of Pacific Northwest commonly referred to cedar as “Tree of Life” for its many purposes. Long/soft strips of inner bark are twisted, woven, and plaited to make variety of items including, baskets, blankets, clothing, ropes and mats. Rafts, frames and dugout canoes can be fashioned from tree trunk. Buds and inner bark of tree also serve medicinal purposes.